We've decided to change things up a bit here in the Recruitment section. Our recruitment structure has been the same for a while and we believe that changing some things will improve the pace of how we do things. In our eyes, the things we have changed are going to make the section run smoother as well as make it easier for people to apply and become an official ADK member. As you all know, the requirements have been 5 posts, 1 introduction thread, and a referral from either 1 ADK staff member or 5 Members. We are going to be changing over to only requiring an introduction thread and 10 posts, and to have joined discord. We think that by making this change it will allow more members to get accepted into the community who don't always have time to hop into discord or chat with game staff when they're on. The changes we have made on the application are to help make it easier to apply for membership. We have removed some parts from it because we thought that it was too long and that some of the questions were redundant. Removing these questions will make the application shorter and avoid confusions people may have had with the application. For awhile one of the requirements to be recruitment staff has been 50+ posts and to be active on forums. Having such a high post count deters people from wanting to become a recruiter because they don't know how to reach the post count, and don't want to stay active on the forums because they think they might not get the job. We have lowered the post count from 50 to 30 hoping that it is a more obtainable goal for someone to reach who wants to become a recruiter. The recruitment staff application was changed slightly because some things were worded oddly or were unnecessary. I hope that more people will be willing to apply to be part of recruitment staff. 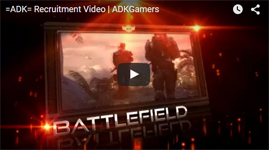 We're always in need of recruiters as recruiters are the base of ADK. We are the ones accepting members and actively trying to bring them into the community. Everything should currently be up to date, but if you see anything that is still outdated or incorrect please let a recruiter or myself know so that we can get that taken care of.